Bridget Mort 1595: the youngest child and possibly the only daughter. She later married Henry Haighton of Kirklees. Thomas Mort of Hulton 1587-1638: was born in Peel Hall. He later married Margaret Smith and purchased Wharton Hall with his father Adam. It is believed he had about 6 children. The eldest of his sons (Adam Mort 1658) became the next Adam Mort of DamHouse after his Grandfather died at the grand old age of 91. 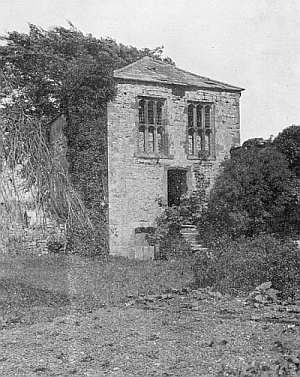 Wharton Hall 1936 - The remains of the Tudor kitchen. Richard Mort 1589- 1628 of Blackrod: He married Ellioner Holme and they had 4 children. Adam Mort 1591-1629 of Preston. Adam Mort was a well respected man who held high ranking positions within his local community. He was High Constable of the West Derby Hundred in 1612 and twice church warden (1615 & 1620). Adam built St Stephens Church in Astley which was consecrated in August 1631 by the Bishop of Chester. Next to the Church Adam built 'Mort's Grammar School'. This was the first school in Astley and was built because of Adams desire that the children of poor families were to be taught free of any charges. Adam Mort was a genourous man who believed that education should be available to all irrespective of social class. Adam died in March 1630 and in his will he left a sum of money for the relief of the poor in Astley and Bolton. In 1595 Adam purchased DamHouse with 60 acres from James Anderton of Lostock. In 1606 Adam then purchased the manorial rights from Sir Thomas Gerard and became the new Lord of the Manor of Astley. There is evidence that Adam extended DamHouse by building a new mansion in front of the original stone and timber mansion. As Lord of the manor he had claim to half the tithes of corn and grain in Astley. It would appear that Adam used his wealth wisely and contributed to the welfare of his tenants. The final resting place of Adam Mort is unknown. To date there is no record of his burial and maybe Adam wished it this way. Many Morts were buried in Deane at the old church, so maybe he lies there with a next of kin. Strangely enough, the page on the register which would have possibly recorded his burial is missing. Other records show many of the Mort family also buried at Leigh cemetry. Adam Mort's eldest son 'Thomas' was to succeed his father as 'Lord of the Manor'. His middle son Richard sadly died before his father at the youthful age of 38 years. He left 4 young children to be raised by his widow Ellioner. His youngest son Adam became a draper and later 'Lord Mayor of Preston'. He married twice and had 4 children. Richard was killed in December 1642 during the Civil War in England whilst defending the town of Preston against Parliamentary forces. Adam Mort's wife 'Jennet' died at the age of 59 on the 3rd February 1623 and is buried at Leigh cemetry as was her father Thomas Mort of Tyldesley just 4 years earlier. It is believed that the direct line of the 'Mort's from DamHouse' ended with Thomas Mort 1645-1733. Thomas died at the ripe old age of 88 and like many Mort men before him (including his brothers Robert and Adam)- he did not marry and did not father any children. Much of the information gathered for this story came from the original book about DamHouse written by John & Sylvia Tonge. These books are still available from the Mort Astley Heritage Trust and profits from the sale of the books are going to be used to refurbish the top floor and the creation of a library of historical items. A greater level of detail (for those of you with a vested interest) plus a pictorial record of Astley can be found in the reference section at Leigh Library.